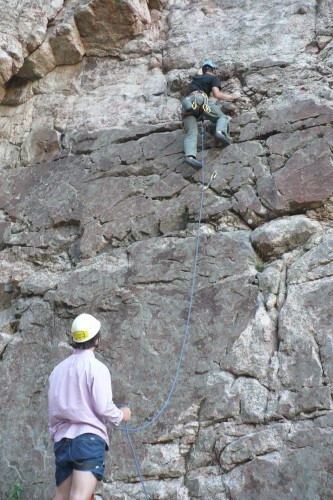 Climbers will participate in an intensive program that takes scouts on climbing routes and boulder problems ranging from 5.0 to 5.12 in difficulty on granite, limestone and dolomite throughout the Shoshone Canyon. Our indoor rock wall is also utilized in the beginning stages of the program or during inclement weather. Climbers will also have multiple chances to rappel down multiple descents. Participants will complete the requirements for the Climbing Merit Badge and most of the requirements for the Venturing Ranger Mountaineering elective. In addition, participants will be introduced to anchor building and placing natural and artificial protection. Climbers are most comfortable in loose fitting, athletic type clothing and should bring everything on the Climbing Gear Checklist including a day pack with: rain gear, two-1 quart water bottles, and sunscreen. Participants may bring their own climbing harness and shoes. YHAO supplies harnesses, shoes, helmets and all climbing ropes and hardware.